“The Invisible Hand” is a bone-chilling, powerful drama that shocks and surprises at every twist and turn of the plot. Artfully written by Ayad Akhtar, 2013 Pulitzer Prize winning playwright of “Disgraced,” the play is set in a prison in Pakistan after Nick Bright (Eric Bryant), a low-level investment banker is kidnapped by mistake. The three captors we meet intended to abduct Nick’s boss, but now have to figure out how to use Nick to raise ten million dollars in ransom money. We meet Dar (Anand Bhatt), a low-level guard who appears to have a gentle soul. Imam Saleem (Rajesh Bose) is the boss who strikes a deal with Nick to raise the ransom by doing what he does best—speculate in global currency. Bashir (Fajer Kaisi) is a British-born Pakistani who studies global markets and debates power with Nick. What is so fascinating about each of these characters is that each is motivated to do what they do for different reasons, and each changes in very unexpected ways. All four actors communicate with precision and passion, and watching the tension they create on stage truly insights the audience’s senses as we see the boiling pot that is the playwright’s story start to bubble. This is socially-conscious entertainment at its best. 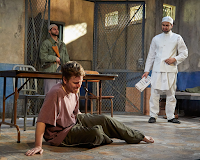 You might expect that this play has both political and ideological themes, but these are only backdrops for what happens as these characters work against our assumptions. The result is that this play is much more about greed, corruption, morality, and human desire. Director David Kennedy understands how to build tension with extraordinarily controlled pacing, claustrophobic set designed by Kristen Robinson, and effective lighting by Matthew Richards. This play was presented last year at the Westport Country Playhouse where it won the Connecticut Critics Circle Award for Outstanding Production, Outstanding Director, and, for Bryant’s performance, Outstanding Actor. Ayad Akhtar’s most recent Broadway play, “Junk” has been nominated for two Tony Awards, including Best New Play. This American-born playwright, actor, and award-winning book author is someone to watch. I intend to start following his career and can’t wait to see how he continues to create such intelligent work about global capitalism, human desire, and the lengths people will go to for power.